I’m posting a short follow-up to a story about huddling penguins that I wrote about a few weeks ago (Heat-sharing Huddling Penguins – A Benefit to Selfish Behavior?). I was pointed to a really fascinating set of videos that show emperor penguins in the process of forming huddles. You can see these videos embedded in the open access publication PlosONE. Here is the link and references: Coordinated Movements Prevent Jamming in an Emperor Penguin Huddle Zitterbart DP, Wienecke B, Butler JP, Fabry B (2011) PLoS ONE 6(6): e20260.doi:10.1371/journal.pone.0020260. The three videos can be found about half way down the article. The second shows a strange rhythmic motion that takes place when the penguins are tightly packed together. The first first video shows a huddle in the process of formation. This video is taken during a time when the temperature is getting progressively colder so the penguins begin with some groups but progressively get closer and closer together. They remain in near constant motion though and you can see here that the leading edge of the huddle which is experiencing a cold wind had penguins that keep breaking off and circling around to the back of the pack and the whole huddle ends up then moving away from the source of wind. This paper actually was published before the one I referred to in my prior post. For Emperor penguins (Aptenodytes forsteri), huddling is the key to survival during the Antarctic winter. 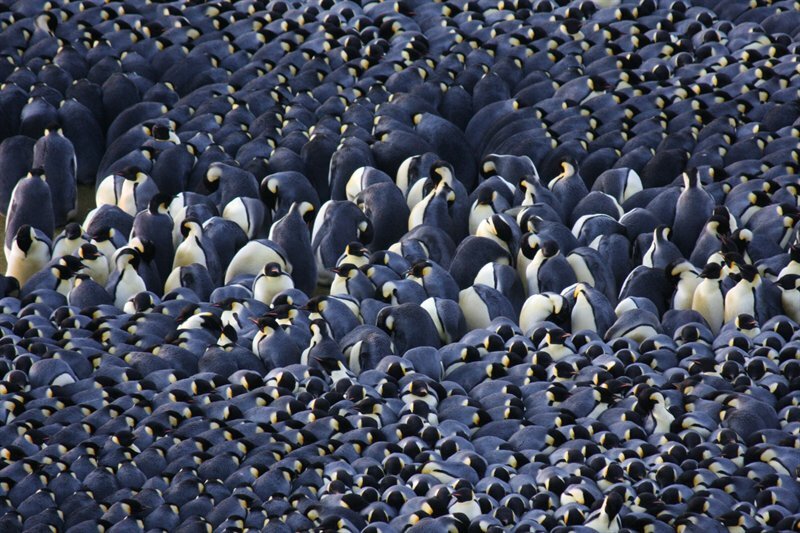 Penguins in a huddle are packed so tightly that individual movements become impossible, reminiscent of a jamming transition in compacted colloids. It is crucial, however, that the huddle structure is continuously reorganized to give each penguin a chance to spend sufficient time inside the huddle, compared with time spent on the periphery. Here we show that Emperor penguins move collectively in a highly coordinated manner to ensure mobility while at the same time keeping the huddle packed. Every 30–60 seconds, all penguins make small steps that travel as a wave through the entire huddle. Over time, these small movements lead to large-scale reorganization of the huddle. Our data show that the dynamics of penguin huddling is governed by intermittency and approach to kinetic arrest in striking analogy with inert non-equilibrium systems, including soft glasses and colloids. The motion described here is similar but a little bit different than in the other study but I believe some of those differences may arise to observation of huddles at different temperatures. The videos clearly show that the behavior of the penguins changes with temperature change. This change then results in different dynamics of the groups such that the whole huddle takes on different shapes and motions over time. Really fun to see these behaviors change and to see that the a number of mathematical algorithms that we use to describe various non-biological phenomena can be used to describe how these penguins are behaving. The center of a male emperor penguin huddle. Image credit: Robyn Mundy.